While the fires in Columbia were still smoldering from Sherman’s invasion through South Carolina, the citizens of Washington D.C. were preparing for President Lincoln’s second inauguration. The night before, on March 3, 1865, Congress stayed in session all night. Among the House deliberations was a minor bill introduced by Representative John Kasson. The most remarkable thing about this bill was not that it authorized the striking of a three-cent piece in nickel, but that it was introduced to the House by Kasson, who had long opposed the use of nickel, in the nation’s coinage. The nickel lobby, led by Joseph Wharton, had finally persuaded Congressman Kasson to not only support this bill but to introduce it, and they did this by presenting nickel coinage as the lesser of two evils. During the Civil War, hoarding of precious metals was so widespread that even the small copper-nickel cents of 1857-64 had disappeared from circulation. Numerous alternatives had been tried, including private tokens, encased postage, postal currency and fractional currency. All were unpopular. The most widespread and least liked was fractional currency. These small paper substitutes for coins wore out quickly, became ragged and dirty and were easily lost. In 1864, Secretary of the Treasury Salmon P.Chase proposed a new issue of three-cent postal currency. That was enough to convince Congressman Kasson that even nickel coinage was preferable to another issue of the universally despised paper money. With Kasson’s support, members of both houses passed the bill without debate, and thus the nickel three-cent was born. The new coins had a silvery appearance, unlike the yellowish caste of the copper-nickel cents. This, no doubt, was useful in drawing the old, unwanted pieces of fractional currency from circulation, and it was also an aid in replacing the non-circulating silver three-cent pieces. The small silver three-cent piece introduced in 1851 was widely hoarded and had not been seen in circulation since the dark days of 1862, when Confederate military victories threatened to tear the Union apart. Since that time, the silver three-cent piece had been minted in very small numbers. 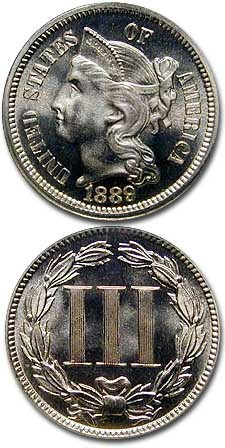 The new nickel three-cent piece was immediately popular, due to its appearance in large numbers in 1865 and its usefulness in replacing the fractional currency. Three-cent coins could also be used to purchase postage stamps, thus eliminating the need for the hoarded copper-nickel cents. What Longacre created for the new three cent nickel coin was a design featuring the head of Liberty wearing a coronet and facing left, with the date and UNITED STATES OF AMERICA around the periphery of its obverse. The reverse is simply designed as well, with the Roman numeral III in the center to signify the denomination, surrounded by a wreath. The head of Liberty required no imaginative leap for the designer. It was a safe piece of work and fit well in the mid to late 19th century Greco-Roman tradition of coinage designs. For all his shortcomings in imaginative design, Longacre was especially adept at designing two coinage motifs: hair ornamentation and wreaths. Both of these design elements are well executed on the nickel three-cents. Liberty wears a beaded coronet with the word LIBERTY in incuse relief. The wreath on the reverse is an adaptation of the laurel wreath previously used on the copper-nickel cent of 1859. Grading nickel three-cent piece is an uncomplicated process because of the simplicity of its design. Wear will first begin to show on the high points of Liberty’s hair on the obverse and on the wreath and Roman numeral on the reverse. Completeness of strike is generally not a problem. On business strikes, however, the first digit in the Roman numeral III is opposite the cheek of Liberty, and as a result some coins are poorly defined on that numeral. Three cent nickel pieces were produced between 1865 and 1889, with a total of 31,378,826 coins struck (including proofs), and all were made at the Philadelphia Mint. The design as adopted in 1865 remained unchanged for the entire 24 years. Although primarily collected as a type coin, within the series there is a remarkable amount of diversity for the date collector. There are several scarce, low mintage issues. The 1877 and 1878 dates were proof-only, and mintages in those years were limited to a paltry 510 and 2,350 coins respectively. There is also an overdated proof, 1887/6, one of only a few overdated proofs in U.S. coinage. Business strikes are plentiful from the earlier years but very rare from most years in the 1880s. Proofs, on the other hand, are rare throughout the 1860s, 1865 being the most elusive with only 400-500 pieces struck. Proofs from 1870 on are usually available (except for the key dates mentioned). Although certain dates are somewhat more difficult to find, the series has no “stoppers,” so complete sets in grades up to MS or Proof 65 can be assembled without too much difficulty and at a reasonable cost. The usefulness of the three cent nickel piece in the first few years of production also held a partial explanation for its demise. Fractional currency (or “shinplasters” as they were derisively known) quickly vanished from the channels of commerce. Mint Director James Pollock never intended for a nickel three-cent piece to be a permanent part of the nation’s coinage system and saw them only as a substitute coin until the silver three-cent piece could again circulate. Ironically, it was the silver coin that was discontinued first, with the nickel coin not following for another 16 years, long after the public had forgotten its unpleasant experience with the ragged fractional currency notes. Finally, after the 1889 issue was struck, all pretense for needing a three-cent coin ended when postal rates changed. The denomination ws discontinued by the Act of September 26, 1890. Millions were returned to the Mint and later recoined into Liberty nickels, and today only collectors remember the curious little coin worth three-cents and made of nickel.